If you’ve been hunkering down in the saltshaker, it’s time to be shaken out. There’s a world that needs to be made fresh and healthy; a world that needs to be seasoned with the Word that preserves; a world that needs to be reminded of what it means to live with moral purpose and decency; a world that needs to learn forgiveness, kindness and caring; a world that needs the healing bite of salt rubbed into the wound that is sin. I pray that we all might be change agents and lights in the darkness, pointing the way to the only hope for the world > Jesus Christ, Savior and Lord. All it takes to get out there is some shaking up, some shaking out, and some courage. Eight years ago, the movie “Amazing Grace,” starring Ioan Gruffudd and Albert Finney, was released in theaters. I loved the film. I was inspired by it. It tells the story of William Wilberforce’s deeply-held Christian convictions that moved him to work for the transformation of the society in which he lived. The man was used of God in astonishing ways. He was not only instrumental in ending the slave trade; he also worked with the reformer, Hannah More, in creating the Association for the Better Observance of Sunday. The goal was to provide all children with regular education in reading, personal hygiene, and religion. He was one of the founders of the Royal Society for the Prevention of Cruelty to Animals which inspired the creation of similar societies all over the world. And he also worked to encourage Christian missionaries to go to India. In 1797 Wilberforce published A Practical View of the Prevailing Religious System of Professed Christians in the Higher and Middle Classes of this Country Contrasted with Real Christianity. Titles, in his day, often went on for days. Under the shorter title, A Practical View of Christianity, the book is still in print today and is still having a powerful impact. Lord Fox went on to say that a Napoleon comes to mind when we speak of greatness but Napoleon was ruthless and, surrounding all he did, were his personal ambitions and the horrors of the wars he waged. Ultimately, he suffered complete and utter defeat; he was conquered. Wilberforce, on the other hand, having completed his selfless quest for justice, would go home to his family, lay his head on his pillow, and go to sleep knowing he had truly changed the world for the better. Wilberforce was a true hero. Do we aspire to such greatness? Do we work to instill in our children, in our grandchildren and do we encourage in our friends, in our fellow Christians, such an aspiration to greatness? Do we expect of ourselves and our fellow Christians, a saltiness that preserves the good and brings a refreshing flavor to all of life? My prayer is that our Heavenly Father might give us the courage to strive for the highest goals, to flee every temptation to be mediocre. My prayer is that He might enable us to aspire to greatness and that He might open our hearts in joy to His call to holiness. May He free us from the fear of failure and shake us all out into the world. The Sermon on the Mount, from which I am drawing this message today, begins with the Beatitudes. It tells us that those who are poor, those who are hungry, those who weep, those whose hearts are pure, those who work to establish peace, those who suffer for the cause of justice–they are all blessed in the kingdom of God. Then the Sermon on the Mount speaks of the response of those who are blessed. ‘You are the salt of the earth,” Jesus said, “you are the light of the world.” All who are blessed are called to responsibility. Christian discipleship is a great responsibility. In the Old Testament, it is the entire people of Israel who are addressed as a royal priesthood, a holy nation. Peter echoes this. Christians, all of us, are a royal priesthood with a ministry and mission to proclaim the wonderful deeds of God. After the Beatitudes, Jesus tells the disciples of their responsibility in society, in the world: “Let your light shine before people that they may see your good deeds and give glory to your Father in heaven.” Christians are to be in the world but not of the world. Christians are called to be the salt of the earth. In the ancient world, salt was highly valued. In the hot, dry and windy climate of the Near East, body salts are quickly lost with perspiration and need to be maintained orally lest dehydration occur. So, in biblical times salt was recognized as a necessity of life. With all the debates over salt in our diets today, the one fact no one challenges is that the human body needs salt to function. Sodium is the main component of the body’s extra-cellular fluids and its helps carry nutrients into the cells. Sodium also helps regulate other bodily functions such as blood pressure and fluid volume and sodium works on the lining of blood vessels to keep the pressure balance normal. We can’t exist without salt but, with salt, it’s a matter of how it’s distributed, in what quantities and where. Let’s think, for a moment, of the important qualities of salt. First, salt is a preservative. It keeps things from going bad. For millions of people in the world, salt still has this purpose. A Christian who is trying to live like Jesus can help things stay fresh and healthy. We can help prevent our schools, our neighborhoods, our families from becoming rotten. We can be used of God to preserve what is good, to work towards reconciliation. Second, salt gives taste and flavor to food. The Christian’s task is to be the salt of society, adding taste, bringing meaning where there is no meaning, bringing hope where there is no hope. To be the salt of society means that we are deeply concerned with its well-being. We preserve healthy moral principles and make a contribution to the development of cultural and social life. We add taste and flavor to the common life. Because there are Christians in a city or in a town, its people should be able to praise God for the harmony and fellowship, joy and happiness, that Christians bring to the common life. For this praise to be lifted, we must be active in our communities. If you are a person who loves God, who walks with Jesus, if you are a person of forgiveness and kindness, if you are a person who cares for those who are hurting, if you are that kind of person, there is a flavor that you bring wherever you go: to your workplace, to your school, to your neighborhood and beyond. A third quality about salt that Martin Luther especially noticed is that salt bites. He said, that when the people in a congregation sin, you should rub the salt into the wounds of their sins. Not so friendly that. If you’ve ever had a tooth extracted, it’s quite possible that your dentist instructed you to gargle with salt. Salt stings but it can also heal. These words of Luther were true in his day and, I’m sad to say, remain true today: “Bishops and successful clergy are the smartest of people,” he said, “for they preach in a calculated manner in order to keep themselves out of trouble by refusing to salt the sins of their people and press for genuine repentance.” When I was pastoring, I would often remind the congregation that, if I was not willing to be honest with them about the sinfulness in their lives, if I didn’t press them to make a genuine change, I might as well be thrown onto a dung heap. Any pastor who doesn’t press for change isn’t worth his or her salt. When you see somebody doing wrong, the tendency is to pour syrup on their behavior, to sweeten up to them. But there are times when syrup won’t do the job. What is needed is salt. And if you have a pastor, a good friend or a parent or other loved one who is willing to rub salt into your wound and press for genuine change in your life, you are most fortunate. The moment for the use of salt must be chosen but the moment must be chosen. The words of the prophets in the Old Testament were tart, cutting and bitter, often tasting sharp like salt. The prophets were acidic in their condemnation of the sins and injustices found among the people of God and in the societies in which they lived. Jesus’ own words were sharp and biting when they needed to be. Salt. When appropriate, our speech must be seasoned with salt. It may not make us popular (it’s certainly shortened the careers of many pastors) but it will find us faithful to our callings and the Lord we serve. In the Presbyterian Book of Order are found what are called the “Great Ends” and I think they offer a great encapsulated picture of the call to Christians. The Great Ends of the Church are: “the proclamation of the Gospel for the salvation of humankind; the shelter, nurture, and spiritual fellowship of the children of God; the maintenance of divine worship; the preservation of the truth; the promotion of social righteousness; and the exhibition of the Kingdom of Heaven to the world.” Great Ends indeed. Great Ends demanding great deeds. Companion to the call to be the salt of the earth is the call to be the light of the world. The New English Bible, interestingly, translates the verse: ‘You are the light for all the world’. Such a command takes us out of our preoccupation with the welfare of the Christian community alone. Our lives are to be an inspiration to the lives of others around us. Our lives are to be as a beacon that shows people the way. Our lives are to be as a lighthouse, guiding other people’s lives through nasty storms. We are to reflect the great light who is our Lord Jesus Christ. We should shine so that others may see our good deeds and praise God. Shining doesn’t mean self-propaganda, self-publicity, self-glorification, but rather bearing fruit in our lives, bringing life and light to others. It is about our deeds in society — in politics, in culture and in social life. In our passage for today, we are invited to live our discipleship out in the world. In our schools. In our places of employment. In our neighborhoods. In our circle of friends. Out in the world. If you’ve been hunkering down in the saltshaker, it’s time to be shaken out. There’s a world that needs to be made fresh and healthy; a world that need to be seasoned with the Word that preserves; a world that needs to be reminded of what it means to live with moral purpose and decency; a world that needs to learn forgiveness, kindness and caring; a world that needs the healing bite of salt rubbed into the wound that is sin. I pray that we all might be change agents and lights in the darkness pointing the way to the only hope for the world > Jesus Christ, Savior and Lord. All it takes to get out there is some shaking up, some shaking out, and some courage. Featured portraits: William Wilberforce in Youth and Age, Jamaica, ca. 1875-ca. 1940. 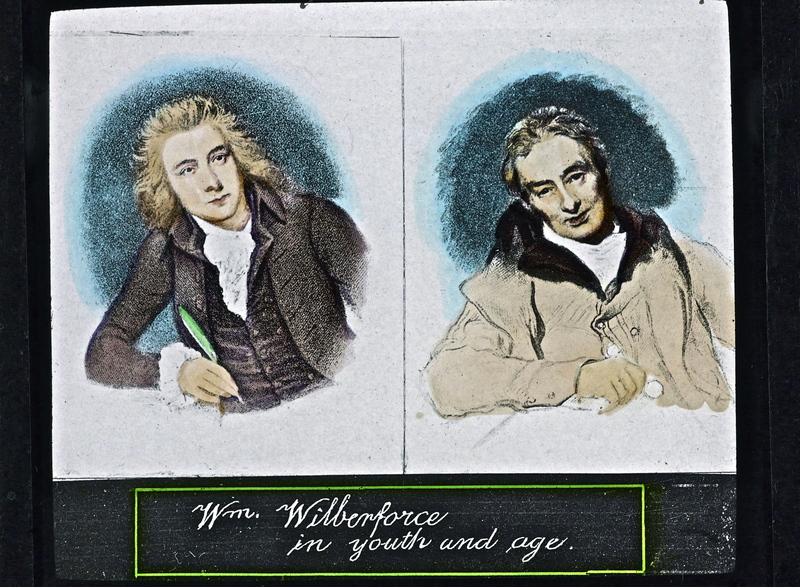 Image of two portraits of William Wilberforce (1759-1833), in youth and in later years, belongs to a series of Church of Scotland Foreign Missions Committee lantern slides relating to Jamaica.